On November 30, 2002 the Zetas stated predicted that the Earth changes caused by the near proximity of Planet X would cause imploding buildings. On March 3, 2009 a perfect example of an imploding buildings occurred in Germany. This was not an earthquake fault, not due to recent maintenance, nor was the building so old that collapse of the building itself would have been expected. Note the mention of recent cracks in the basement floor. The implosion was due to the ground under the building giving way. Cologne's six-story city archive building rumbled and then collapsed into a pile of rubble. Many people inside were able to flee to safety, but authorities said they were searching for three people missing from nearby buildings. 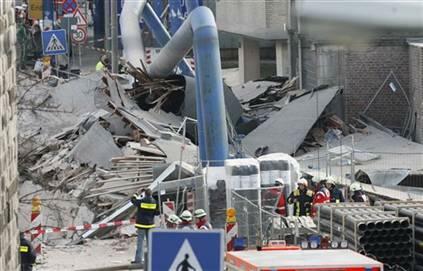 The collapse, which occurred about 2 pm, also dragged down parts of two neighboring buildings in the western German city. "Suddenly there was a rumbling, as if a train were going past," witness Alfred Hoovestaedt. "Then the noise got louder and louder, and we heard vibration. Then, in seconds, the whole area was covered in a haze." Florian Hacke, who lives two buildings away, said he ran out of his house after he heard a creaking noise and cracks opened up in his ceiling. Alerted by the sounds that preceded the collapse, staff and visitors at the Cologne archive were able to get out in time. The modern-style building opened in 1971. A longtime archive employee, Eberhard Illner, told a German radio station that he had noticed cracks in the basement last year.